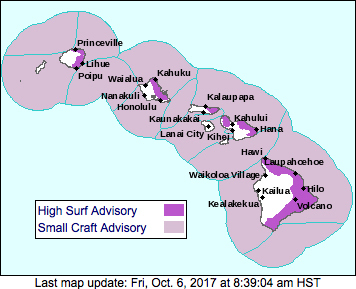 The National Weather Service in Honolulu has issued a High Surf Advisory for east facing shores of the Hawaiian Islands until 6 p.m. this evening (Oct 6). Surf is forecast to be in the 5-8 foot range along east facing shores. A Small Craft Advisory is in effect for Hawaii Island windward, leeward and southeast waters until 6 p.m. this evening (Oct 6). The forecast is for winds and seas from the east at 15 to 25 knots and seas 6-10 feet in height. A small craft advisory means that winds speeds of 25 to 33 knots and/or seas 10 feet or greater are expected to produce conditions hazardous to small craft. Inexperienced mariners, especially those operating smaller vessels, should avoid navigating in these conditions.